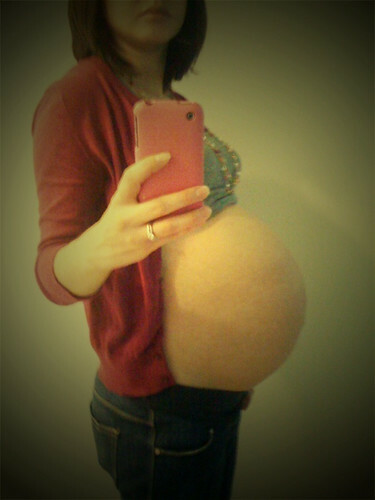 38 weeks and counting- FULL TERM! Any day now…that is the waiting game that we’re playing in this house! It’s been an interesting few weeks. I’ve finished closing stuff down at work and baby’s room is officially done. The car seat is in and the hospital bags are semi-packed. We just need a baby now! I’ve been feeling overall not terrible. I wouldn’t say great, but not terrible. This past weekend was probably the worst of it since I had some false labor contractions. At least, that’s what I think they were. Each time there is a new ache or pain, I’m always asking myself, “Is this is? Is this what a contraction is supposed to feel like?” Then I tell myself that if I have to ask that it probably isn’t. However, if you look up what others say about what contractions feel like (yes, I’m the dork that googles “labor contraction symptoms”) then you find out that they feel different to everyone. Some find it painful while others just find it REALLY uncomfortable. So, who knows? I’m going to guess that my pains yesterday were labor contractions, but not the real things since they were very inconsistent. As for everything else, I waddle now and have a hard time sitting still. No position is comfortable what so ever. I am extra whiny about things- but, I feel that since I haven’t really complained once this whole pregnancy I am allowed my occasional gripe now. Baby is officially ready to go (as you can see, so am I)! S/he should be weighing in at about 6.5-7 pounds. S/he still moves, more squirming than actual full kicks since there isn’t much room in there. I have officially dropped and about 1 cm dilated as of Friday. However, with all the contractions I had this weekend I guess there is a possibility it could be more. Now we just wait for this little one to make his/ her arrival! The final month is here! I’ll be at 36 weeks next week, which means my due date is about one month away. I can’t believe how fast the time went! I know some people say pregnancy is a 9-month long waiting game, but it really has felt like a blur. 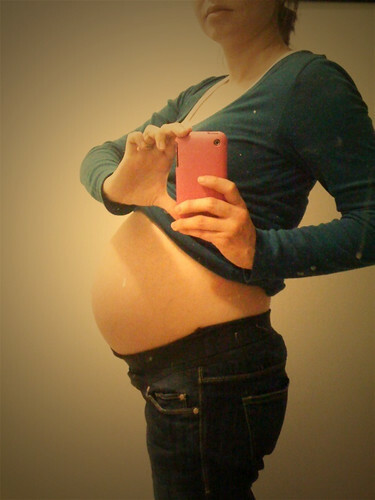 I think being pregnant during a really busy work time was a great thing for me. I never felt like I was waiting around, and it kept me walking on my feet most days (great for no swelling and keeping weight at a normal level). The past few weeks have been the usual busy. I’ve been slowly closing stuff up at work to be sure it is all ready for my maternity leave, and we had some of our favorite family members in town last week. It was so nice to host people in our newly renovated home! Also, we got to show them around Orlando. That means this preggers woman went on a canoe to see gators, walked all day around Disney World, and ate some really yummy food complete with dessert. It was as if we were on vacation too! My aunt and my cousin also did a belly cast on me. It is such a great keepsake to have and pass on to this little one when s/he is old enough. 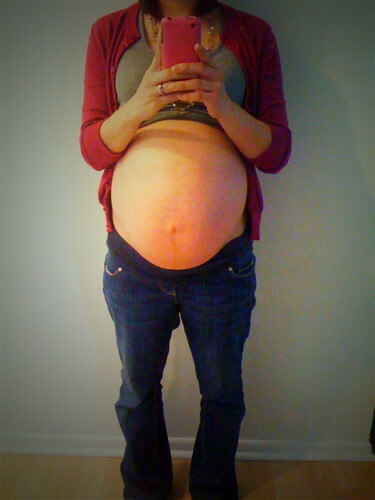 It’s pretty cool to see yourself and how big the belly actually is. The baby is really no longer a little peep anymore! S/he is almost a full-grown peep, probably weighing in at about 5 pounds or so and 20 inches tall. Big peep will continue to grow and fill out in the next few weeks. 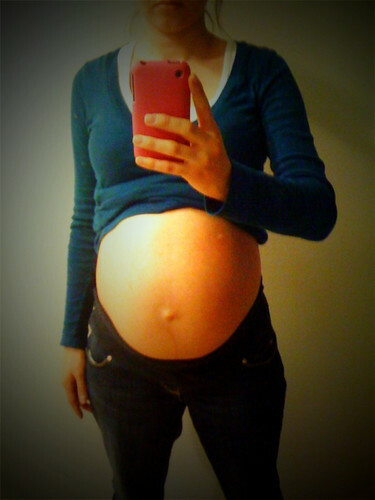 (This shocks me since I don’t feel there is anymore room in me for this baby!) Baby’s brain will continue to develop. Big peep is also head down now since the heartbeat can be taken toward the lower bottom of my stomach. S/he continues to squirm and move, making it quite uncomfortable for mom. I especially don’t like the punches and/ or head bunt to the bladder. With a month to go, we all get to meet this little one very, very soon. So scary and exciting at the same time!